Rising out of the Arthurian mists of Avalon and the world famous Glastonbury mud, Cineramageddon is a unique post apocalyptic and nocturnal ambience in which to watch an unforgettable program of films in ways never seen or dreamt of before. A five day film festival within the Festival, Cineramageddon will take place outside and under the stars in a new sculpture field at Worthy Farm, showing must see, talking point movies in the company of legendary renegade movie guests. Curated by director Julien Temple, with state of the art projection, the biggest cinema screen in Britain and an auditorium courtesy of artist Joe Rush featuring fifty mutated vintage American and British cars, repurposed funfair rides and a Lear jet. 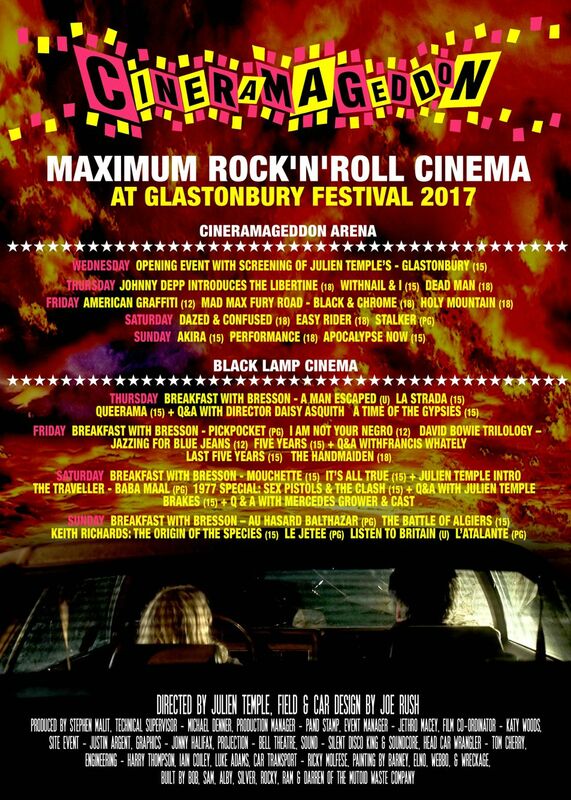 From Wednesday night through to dawn on Monday, Cineramageddon will present a new kind of rock ‘n’ roll cinema attitude, a midsummer cinematic explosion, through the Glastonbury night and out the other side. Advance booking of the cars, or early arrival to secure a set of headphones, is advised to ensure you will be part this thrilling cinematic history. Alternatively, visit during the day to wander through the sculpture park and catch a pre-release film, alternative classic or Q&A talk in the daytime Black Lamp Cinema tent.